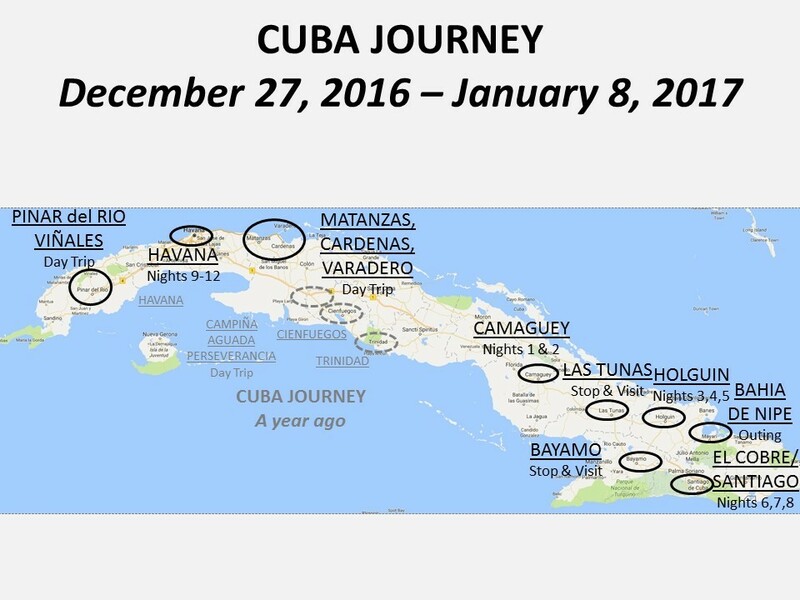 We were blessed with the opportunity to return to Cuba from December 27, 2016 through January 08, 2017. (See HERE for our posting from last year’s trip.) This trip focused on the amazing work the Catholic Church is doing through its valiant priests, bishops, archbishops, nuns, and committed laity. We met some of these wonderful folks and had the opportunity to share with them truly ‘people-to-people’. We also had the opportunity to soak in some of the natural beauty of Cuba, partake of the (relatively) new entrepreneurship spirit of the emerging restaurant and lodging industry, and walk the streets and visit sites with everyday folks – and folks visiting from throughout the world. This journey builds on what we did last year – and helps us discern what is next for us; for Cuba. After the pictures is a brief reflection on our sentiments in the moment. NOTE: If you want the video to open in a new tab (without closing this one) try ‘right click’ on your mouse and selecting ‘open in new tab’. O Cuba. Deep is the hurt. The love must be deeper. O Cuba. You are full of contradictions. Rulers that ruthlessly rule with an iron fist. A society where paranoia and mistrust are embedded in every relationship. Yet people are seemingly as friendly and joyous as any in the world. O Cuba. Some longing to be. Most longing to leave. All longing for that balance in life that is universal: Balancing doing good for others and looking out for yourself and your family. O Cuba. Where destruction, deconstruction, reconstruction, and innovation magically co-exist, weaving into a tapestry of sights, scenes, and sounds that is truly magical. Only they can provide you enough for subsistence. No job, profession, or position – other than within the 1% of those at the top of the power ladder – can provide enough resources to more than merely survive. O Cuba. Where figuring out how to get your most basic essentials – toilet paper, aspirin, milk, toothpaste – becomes a daily struggle as the island manufacturing, farming, and bureaucratic workforce is slowly – and dangerously – crawling to a halt… Where an archaic double currency keep the population enslaved… Where ‘resolver’ (resolving) is life encompassing. O Cuba. Desperation and despair. Beauty and grace. Old elegance and new mystique. Personally, my recent journey back to Cuba bookends a year of journeys. These journeys complete a lifelong search to reconnect with my heritage and spiritual roots. First to Cuba a year ago – for the first time, 49 years to the date of when I first left – to connect with the memories of where I grew up for the first nine years of my life. Then to Spain’s Camino Ignaciano in the summer to trace the steps of San Ignacio de Loyola, my cornerstone saint. And recently a journey to Cuba’s eastern parts, including a visit with the Virgencita de la Caridad at El Cobre, my Mary – and Cuba’s – to whom I’ve been devoted since childhood and consecrated to as an adult. As I enter my 7th decade of life, I do feel these journeys are mighty timely. On one side we have those of us here, reaping the benefits of a life enlightened by our six decades of exposure to commercialization, consumerism and infinite information. On the other side we have those of us there, reaping the benefits of a life enlightened by the inventiveness required to survive in poverty, deprivation and the absence of information. Aquellos aya donde se ha confundido patria con partido; donde solo el partido tiene poder; donde para ser hay que pertenecer. Y nosotros aquí donde hemos confundido patria con poder, consumerismo con calidad, y tener con ser. I know the hurt is deep. The hurt caused by inflicting harm, separation of families, and decades of physical and thought control is deep and real… But love must be deeper. Whatever changes life brings, whatever challenges lay ahead, whatever twists are on the road, however politics play out, these journeys I’ve taken in the last year are ultimately – I pray – for the Greater Glory of God…. And, I pray these journeys have helped form me as I make decisions on where and how to add value to this undefined and dysfunctional process of co-creating the Cuban experience there and here with people of good will.